of photobooth friday! how is this possible? wait, don't answer that. this I do solemnly swear: as long as there are photobooths, I will be jumping into them. and as long as I am here on the internets, I will be sharing. p.s. that is ezra up there, top row, second frame. THAT IS EZRA. happy six!!! how friggin cute is ezra...i mean...jeez, that face! :)also, yes, he's becoming enormous. stunning family, andrea! 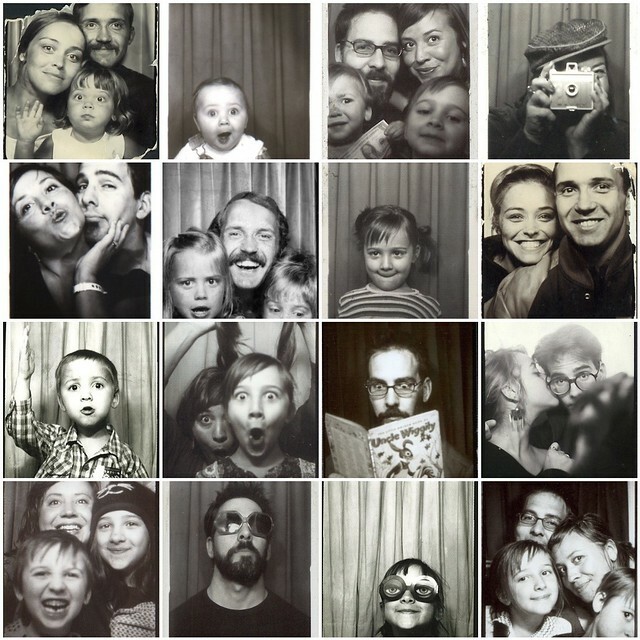 L O V E your photobooths. happy six years! A celebration is in order!! I wish we had more of these beautiful booths in the UK! I am yet to find one that isn't modern! What a good looking family you are! Love photo booths. Great shots! absolutely love that progression of ms. ava as she has gotten older and more and more beautiful. you can see the wisdom she is gaining about life in those calm eyes and sweet smile. what a wonderful, awesome girl she is. and that ezra. third row, first frame. absolutely love it. Photobooth pics are dear to my heart. That pic of Ezra.....TOO cute. I love EVERYONE of these photobooths! Makes me smile real big:) Love y'all!